New Who started this whole “Christmas Special” idea. A grand story, involving Christmas in some way, that somehow ties into the over-arcing storyline but only just. So far we’ve had giant cybermen towering over Victorian London; a planet where sharks swim through the smog and ruled over by Scrooge; trees that grow Christmas baubles and Bill Bailey worrying about the image of their company the encounter projects; an ice-governess and Clara dying (again). Though, to be fair, that last episode did have some grand comedy sequences. Shall I get the memory worm? Last night we hit an all-time low for the Christmas Specials. And they’ve been pretty dreadful (even for Dr Who, as my wife put it). I was hoping for something grand, something spectacular, something amazing, coming as it does on the back of a rather good 50th Anniversary special and ending, as we already knew, with the introduction of a Doctor that shouldn’t be possible – a regeneration that puts him well over the limit. But no. 1 hour, a mere 15 minutes longer than a standard episode, isn’t long enough to put a story of this magnitude. As they proved with David Tennant’s final episodes, an hour and a half is too long (by about 20 minutes wandering around and revisiting past companions). It crawls, stumbles and flounders along for about 45-50 minutes, tries to tie up some dangling threads of storyline that have been left hanging since the first season of Matt Smith’s Doctor, reminds us of at least one species they’ve not encountered since the 5th Doctor started the Great Fire of London, tease us with a brief look at a rather nasty-looking Dalek variant and then hand-wave a new regeneration cycle. It then takes an inordinate amount of time for the regeneration to actually happen – my kids were not impressed with the speed and subtlety of the process, they were expecting the full sound-and-fury that’s accompanied every other regeneration they’ve seen on New-Who. And that’s that. Smith out, Capaldi in, hang around until some time late next year for the next episode. As a way for Matt Smith to end his tenure as Dr Who, it was disappointing. He’s had better stories written for him. And that’s what’s so irritating! Stephen Moffat can write such brilliant stories! He’s given us some of the best episodes of New Who and, unfortunately, also some of the worst. Anyway, farewell Matt Smith. It’s been a great few years, I hope you’ve had as much fun as we have. 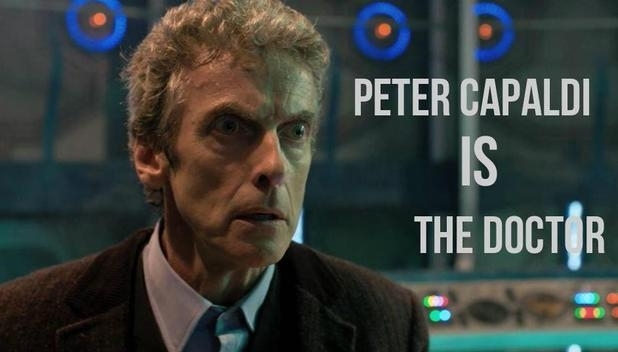 I do look forward to seeing what direction Peter Capaldi’s Doctor takes the show but I do think it’s about time, as someone put it on Facebook, that the writing team regenerated.